The Indianapolis Colts today agreed to terms with unrestricted free agent running back Frank Gore. Gore, 5-9, 217 pounds, joins the Colts after playing 10 seasons (2005-2014) with the San Francisco 49ers, where he earned five Pro Bowl nods (2006, 2009, 2011-13) and became the team’s all-time leader in career rushing attempts (2,442), yards (11,073), touchdowns (64), 1,000-yard seasons (eight) and 100-yard games (38). He also ranks second in team history in career receptions (342) and receiving yards (2,883) by a running back. Gore is the 11th player in NFL history to record at least eight 1,000-yard seasons and currently ranks second among all active NFL players in rushing attempts and yards and fifth in touchdowns. He ranks 20th in NFL history in career rushing yards. Last season, Gore started all 16 games for the third consecutive year and registered 255 rushes for 1,106 yards and four touchdowns, while adding 11 receptions for 111 yards and one touchdown. It marked his fourth straight year rushing for over 1,100 yards. In 2009, Gore posted a single-season career-high 10 rushing touchdowns. In 2006, he earned his first career Pro Bowl selection after setting single-season franchise records with 312 carries, 1,695 rushing yards, 2,180 scrimmage yards and nine 100-yard rushing games. Since being selected by the 49ers in the third round (65th overall) of the 2005 NFL Draft, Gore has totaled the most rushing yards, second-most rushing attempts and has tied for the sixth-most rushing touchdowns of any player in the NFL over that span. In eight postseason starts, he has notched 140 carries for 646 yards (4.6 avg.) and five touchdowns, in addition to 18 receptions for 167 yards. 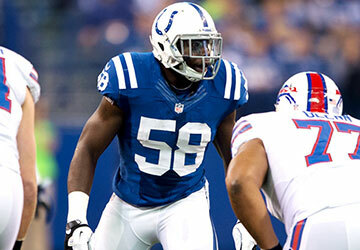 The Indianapolis Colts today agreed to terms with free agent outside linebacker Trent Cole. Cole, 6-3, 270 pounds, was named to two Pro Bowls (2007, 2009) and was an Associated Press Second Team All-Pro (2009) in 10 seasons (2005-2014) with the Philadelphia Eagles. He posted the second-most career sacks (85.5) and double-digit sack seasons (four) in Eagles history behind Reggie White, while his 20 career multiple-sack games rank third in team history behind White and Clyde Simmons. Cole currently ranks 11th in career sacks among active NFL players. Last season, Cole recorded 64 tackles (38 solo), 6.5 sacks, three forced fumbles and two passes defensed, starting in 15 games. He joined Vinny Curry as the only pair of teammates in the NFL in 2014 with at least 6.5 sacks and three forced fumbles apiece. In 2007, Cole set single-season career highs in tackles (103), sacks (12.5) and forced fumbles (four). He also notched 12.5 sacks in 2009 and 10.0-or-more quarterback takedowns in three-straight seasons from 2009-2011. For his career, Cole has started 145-of-155 games, totaling 795 tackles (495 solo), 85.5 sacks, 19 forced fumbles, 16 passes defensed, three fumble recoveries and one interception returned for a touchdown. He has started eight postseason contests, registering 47 tackles (31 solo), 2.5 sacks and two passes defensed. Originally a fifth-round draft pick (146th overall) of the Eagles in 2005, Cole was named to the USA Today All-Joe Team in three consecutive seasons from 2006-08. 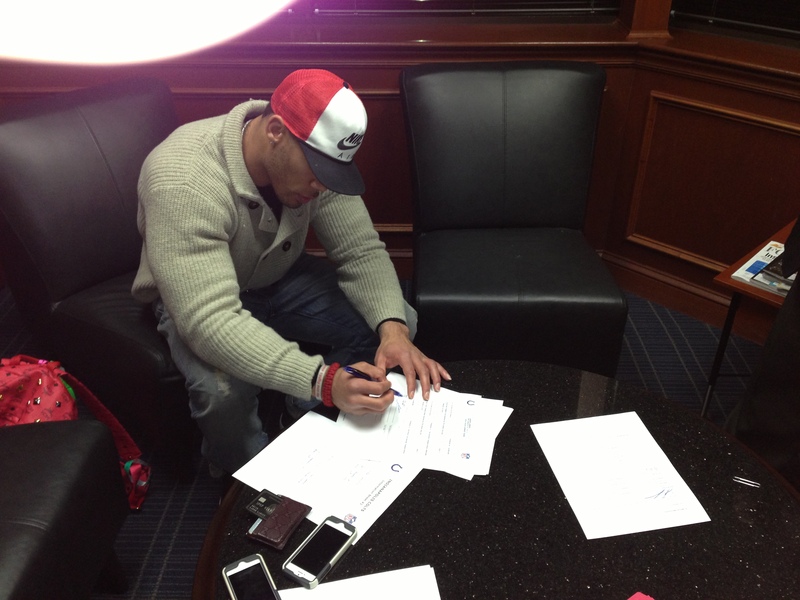 The Indianapolis Colts today signed unrestricted free agent safety LaRon Landry. Landry, 6-0, 220 pounds, started 79-of-80 games played with the Washington Redskins (2007-2011) and New York Jets (2012) and holds career totals of 534 tackles (395 solo), 39 passes defensed, six interceptions, including one returned for a touchdown, 10 forced fumbles, 5.5 sacks and five fumble recoveries. Last season with the Jets, Landry earned a Pro Bowl selection after posting career highs in tackles (113) and forced fumbles (four), while tying his personal best for interceptions (two). In Week 7 at New England, he posted the second-highest tackle total of his career when he made 17 stops (14 solo) to go along with one pass defensed. In 2010, Landry logged 101 tackles (73 solo) in nine starts to go along with 11 passes defensed, one interception, one forced fumble, one fumble recovery and 1.0 sack. In 2007, Landry became the first Redskins rookie since 2001 to start every game of the season. He was named to the NFL All-Rookie Defensive Team after finishing third on the Redskins with 97 tackles (62 solo) and 11 special teams stops. In Washington’s NFC Wild Card playoff game at Seattle, he recorded the first two interceptions of his career when he picked off quarterback Matt Hasselbeck twice in the fourth quarter. 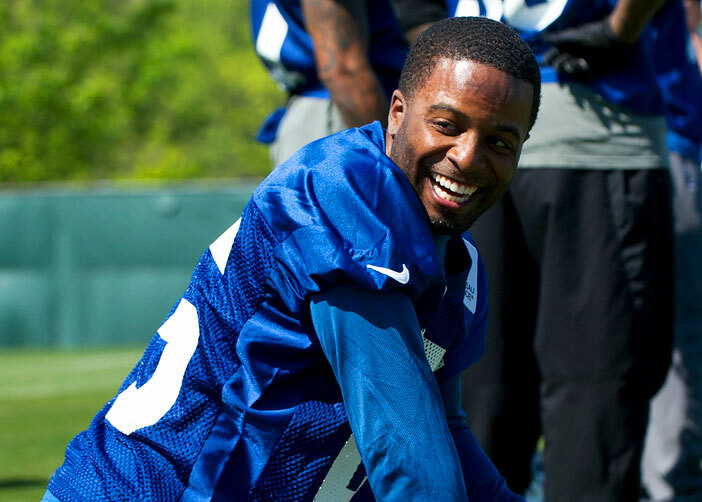 Indianapolis has lost two players via unrestricted free agency – cornerback Jerraud Powers and quarterback Drew Stanton. Powers joined the Colts in 2009 as a third-round draft pick. He started 34 games over his first three seasons, while opening eight contests in 2012. Powers ended this past season on injured reserve with a toe injury. He started every career appearance and played on the club’s 2009 Super Bowl XLIV squad. Stanton opened four of 12 career games with Detroit from 2007-11, then departed for the New York Jets. The Colts obtained Stanton in a trade with the Jets last March. Stanton was the only veteran quarterback on the Indianapolis roster last year, but he saw no action as rookie Andrew Luck took every offensive snap. His departure leaves the Colts with two quarterbacks, Luck and Chandler Harnish. The Colts wish the best for Powers and Stanton. 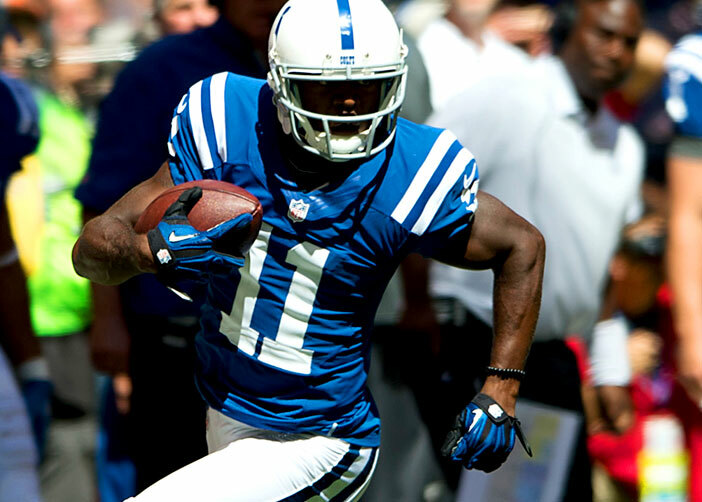 The Colts’ receiving corps has taken a new shape. Donnie Avery has joined Kansas City. Avery came to the Colts last year after recovering from a knee injury that shelved him in 2010 after two productive seasons with St. Louis. Avery played in eight games with Tennessee in 2011, then joined the Colts last March as an unrestricted free agent. Avery was signed because of his speed and ability to stretch a defense. He did so very well with the club last year. Avery ranked second on the club with 60 receptions, while his 781 yards ranked third. His three scoring receptions tied Dwayne Allen, behind T.Y. Hilton (seven) and Reggie Wayne (five). Avery held a 13.0 average, snaring passes in the first 15 games. Perhaps Avery’s most memorable game came in Detroit when he caught five passes for 91 yards and two touchdowns. It was his 14-yard scoring reception at the gun that helped Indianapolis earn a 35-33 comeback win. It marked the first time since 1990 the Colts won a game on a last-play touchdown pass. Avery started 15-of-16 appearances and ranked third on the club with nine receptions of at least 20 yards. We wish Donnie continued health and success.